Latex pillows are a great alternative to memory foam pillows especially if you’re looking for something that will provide pain relief. They are comfortable, and don’t get hot like memory foam pillows do. The best latex pillow can significantly improve your sleep quality. This is a good option for anyone who’s been having issues sleeping or waking up in the morning feeling unrested. They’re also a good alternative to you current pillow if you’ve been experiencing aches and pains in your neck region when you get up in the mornings. When it comes to latex pillows, the products below are the top products that will help you sleep better. Best Latex Pillow for the Money: This is a good choice if you’re looking for a latex sleeping pillow that’s affordable. At around $30 is something that you can enjoy if you’re on a budget. The Beautyrest latex foam pillow is manufactured by Hollander, the largest bedding supplier in North America. Latex, which is derived naturally from tropical rubber trees, is an excellent filler for pillows because of its ability to bounce back when compressed. You will not have to worry about the pillow becoming flat and unresponsive over time. The latex also has inherent antimicrobial properties, a potential boon to your overall health. This pillow comes with a 250 thread count cotton outer shell that provides sturdy yet comfortable support for the sleeper’s head and neck. The standard size pillow is: 24” long and 16” wide; 5” thick. A Queen sized pillow is: 29” long and 18” wide; 6.1” thick. And a King sized Beautyrest pillow is: 31” long x 16.7” wide; 6.8” thick. A Caress Plush Latex Pillow by Classic brands is filled with a latex foam designed for ample air flow through the pillow. The use of latex means that the pillow is environmentally friendly. Plus, it naturally resists dust mites and bacteria and is hypoallergenic. This makes it ideal for anyone who’s sensitive or has allergies. The generous 4.5 inch thickness of the pillow helps to support and align the head, neck and spine; making the Caress Plush a good choice for back and side sleepers. The supportive construction of latex also makes it helpful should you suffer for back pain or neck pains. This pillow comes with a Velour and cotton outer layer. The cover can be removed for washing as needed. A second inner cover helps keep the foam clean while the outer layer is being laundered. This pillow comes with a 3 year warranty and is offered in king and queen sizes. King size measures: 33” long by 16” wide and 4.5” thick. Queen size measures: 27” long 16” wide and is 4.5” thick. 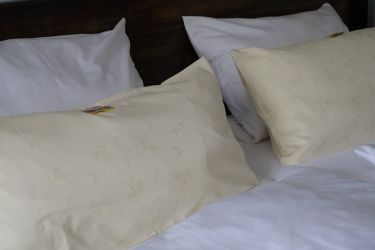 An Organic Textiles natural latex pillow has a hypoallergenic, bacteria and dust mite resistant latex interior. The resistance to dust mites as well as to mildew is not just a barrier against disease, but also helps prevent the occurrence of unpleasant odors. The latex used in this product is formed to provide maximum air flow and to maintain shape to provide a high level of comfort and support for its user. This makes it less hot to use compared to memory foam. The inner covering also helps keep the sleeping environment cool by wicking away moisture. This pillow comes with an organic cotton cover that can be easily removed for machine washing as needed. The king size measures: 34” long by 16” wide and 6” thick. And the queen size measuring: 30” long by 16” wide and 5.5” in thickness. Best Latex Pillow: As far as quality is concerned, this has our top rating. It is both comfortable as well as supportive. Plus offers a good amount of pressure relief that makes it very helpful if you suffer for back pain or joint pain like in the hips. This pillow also uses Talalay latex which offers higher quality compared to natural latex used by the other products above. The Z Pillow by Malouf is a luxuriously dense Talalay latex foam pillow made especially for back and stomach sleepers. Talalay refers to the method in which the latex is developed into a usable product. The Talalay method may be more environmentally friendly than others and must only enhance the naturally occurring allergen, dust mite and bacteria resistant properties of the latex. The foam in the Z pillow is constructed and formed into zones to enable it to provide consistently superior support to a resting person’s pressure points. The foam in the Z also allows for a high degree of air flow and in so doing keeps condensation to a minimum and temperatures consistent. The high quality velour cover can be removed as needed for washing. The Z pillow’s 5 year warranty is what gives it the push needed to be considered the best latex pillow. The best latex pillows make a big difference for anyone who has been suffering from aches or pains from their current pillow. This type of pillow offers excellent support and gives you the comfort that will not only let you sleep deeper but also wake up refreshed without any pain.